The way many people view Oregon football today is how it has been portrayed over the last five years. Everything about Oregon is cutting edge, futuristic, and new. The true fans know that this is not Oregon football. While all of the buildings and the uniforms are great, they are simply a by-product of what has been a solid foundation. It has gotten to the point where if Oregon is not a national contender, many fans think the season is a disappointment. This is where every program wants to be — a yearly contender, but many people know only of this five- to six-year run that Oregon has been on. Anything before 2009 does not exist to them. They have accepted this as Oregon’s historic tradition, but as true fans know, it was a very long struggle to get to where we are today. 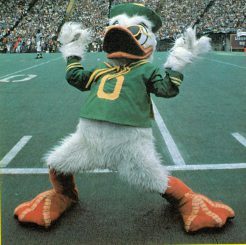 Now when some fans start giving up on the team after a loss or two, it is because they don’t understand what Oregon football is. Joey Harrington has a message for all those would be Duck fans. Every program faces an event that is categorized as their lowest moment. USC had the sanctions in 2009; Oregon had the 1983 season. Before the Pac-12 titles and national recognition, Oregon was a joke. The two previous seasons Oregon had managed only two wins each season. The only team to be in worse shape was Oregon State. Back then, Oregon couldn’t have been further from what they are today. Oregon was slow, had basic facilities and Autzen was not a home field advantage. 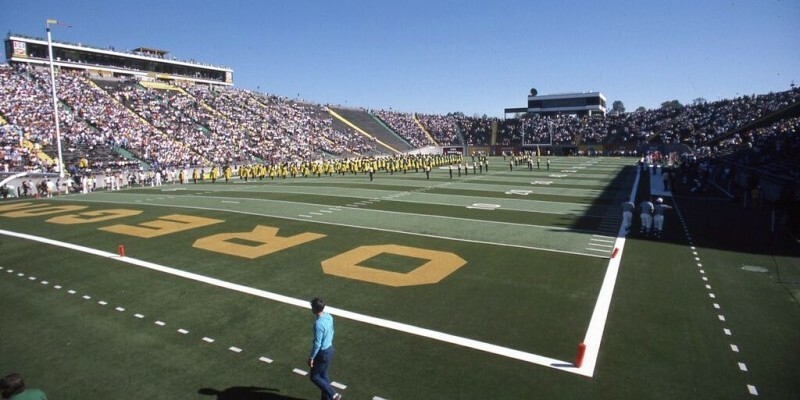 With a few exceptions, Autzen struggled to have a attendance over 30,000. Oregon was just a downright bad program. For many programs this lack of success would be the low point, but for Oregon it only got worse. It was not the best of times. Heading into the ’83 Civil War Oregon and Oregon State had a combined six wins. Neither team would be going to the postseason, which meant that the game was simply for bragging rights. Instead of a hard-fought game in which both teams had nothing to lose, what we got was possibly the worst football game ever played. The teams were bad, the uniforms were bad and the weather was bad. There was a total of 11 turnovers, four missed field goals and sloppy play. A downpour and high winds made simply holding onto the ball a challenge. A game with this level of ineptitude rightfully ended the only way it could — in a 0-0 tie. There were a few positives that came out of the Toilet Bowl. First, it was the last tie in NCAA history. Also, this marked the lowest point in program history. After the ’83 season there was nowhere for the program to go but up. Little by little the program improved and eventually they earned the backing of Nike. What the country sees from Oregon now is a result of the hard work that so many people have struggled to build. What better way to truly understand what Oregon football is than with the Mighty Oregon DVD? Look back and see how Oregon built themselves up after the infamous ’83 Toilet Bowl.